The infinite variety of theatre in London means you can be laughing at the theatre one night, crying the next night. Or, when it’s really powerful, alternating between both on the same night. In my companion Theatre Diary piece, I shared some of the comedies I’ve enjoyed recently. Now I turn to the top-notch drama evenings of my diary pages. As usual, I’ve listed productions in closing date order. Note, the first two finish this month – so don’t delay! I’ve seen numerous World War I-centred productions jumping on the centenary bandwagon over the past year, but none like this. 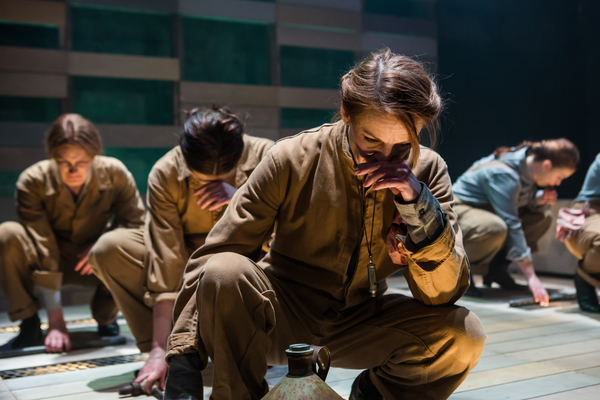 For a start, Out of the Cage is performed by an all-female company and, rather than telling the horror stories of men in the trenches, it centres on the plight of the women back at home – who made the shells that rain down on the other side’s trenches. The battlefield casualties from “the war to end all wars” – nearly 17 million deaths and 20 million wounded – made it one of the deadliest conflicts in human history. So it’s small wonder, in comparison with such staggering bloodshed, that industrial accidents from the period may be overlooked by history. I’m therefore grateful to writer-director Alex McSweeney (a man, by the way) for bringing this story of women munitions workers to my attention. The poetry of McSweeney’s script – which is also rife with cockney colloquialisms – is enhanced by John Chambers‘ original songs and Zeppelin-warped soundscape and Simon Pittman‘s hypnotically dance-like movement, which gives form to the machinations of both factory equipment and one woman’s TNT ravaged human body. The eight-strong ensemble includes Heather Bleasdale, Milly Finch, Tegen Hitchens, Emily Houghton, Sarah Madigan, Jill McAusland, Katherine Tozer and Lindsay Fraser, who also commissioned and produces this world premiere for Fine Line Productions, in association with Robin Keynes. Out of the Cage continues at the Park Theatre until 14 February 2015. Irishman Richard Molloy‘s debut play comes to Theatre503 via Dublin care of Irish theatre company, Pixilated Plays. For its home audience, of course, the historic setting of the play – in 1995 – won’t have been lost on anyone. For me, I was dumbstruck to learn, through the play, that that was the year when a public referendum finally passed to allow divorce in the country. A similar referendum in 1986 had failed, with 65% of the population voting to keep divorce banned. The law only changed in 1997. Let me just reiterate that: as recently as 18 short years ago, you could not get legally divorced on the other side of the Irish Sea. Wow. I’m not sure quite what I was doing in my late ’90s London life for this to have escaped my notice, but thank god I was here and not there, given that I was about to go through my own divorce. Anyway, for me, this is a fascinating moment in time to set a story about the disintegration of a marriage, the myriad causes of that disintegration, and the toll it takes on all involved – particularly in a country where such a high stigma is attached. Owen McDonnell is charming, disarming, and then terrifying, as the tortured thirtysomething man with a weakness for wine and women, who in the course of one day screws up relationships with three different women: his estranged wife (Carrie Crowley), his mouthy teenage daughter (Roxanna Nic Liam) and his Americanised would-be girlfriend (Susanna Stanley). Simon Evans directs. I don’t think divorce should be too easy or too celebrated, but this is a tale that makes you realise just how lucky some women are that divorce exists when escape truly is necessary. 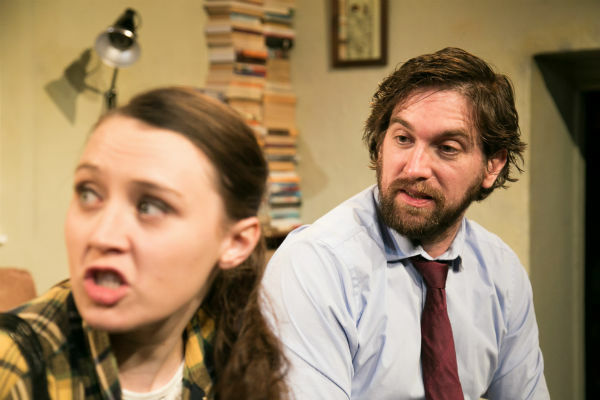 The Separation runs at Theatre503 until 21 February 2015. I hate it when people talk about a show by telling you how much better an earlier production of the same piece, that you will never have a chance to see, was by comparison. But I must indulge slightly in the case of The Changeling, as I recall so vividly Declan Donnellan’s fabulous Cheek by Jowl revival in 2006. Middleton and Rowley’s Jacobean tragedy centres on a tragic love plot, offset by a comic subplot set in a madhouse. In Donnellan’s modern-dress production, played out in Barbican’s functional concrete backstage area, all the characters are inmates in the asylum – underlying just how similar the throes of lust and lunacy are. Hattie Morahan is a vivacious, curly-headed Beatrice-Johanna, especially amusing when imbibing a potion to prove herself a maid, and Trystan Gravelle as DeFlores makes it easy to understand how repulsion can be attractive. Wonderful live music too care of composer Claire van Kampen and her musicians. This experience of The Changeling will also be memorable for me thanks to the lady sat next to me, Vicky from Norwich, who chatted to me excitedly about her first return visit to the Globe. She’d been dragged to Bankside once before when she was a teenager, as part of a school group, and hated it. By the end of The Changeling, the now 32-year-old Vicky was crying and leaping to her feet to applaud the company. I think I just witnessed the birth of a new committed theatregoer. Magic. 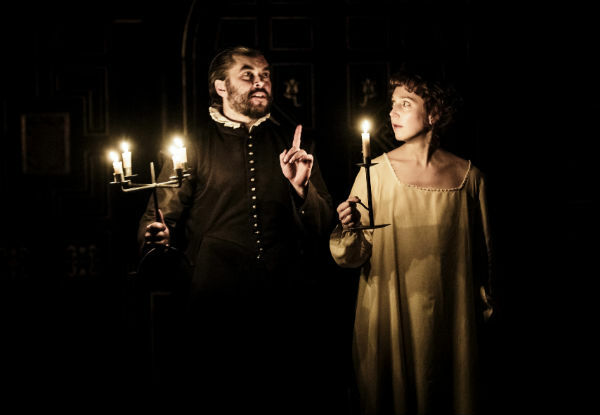 The Changeling continues at The Globe’s Sam Wanamaker Playhouse until 1 March 2015. West End producer Mark Goucher has taken several brave risks with Taken at Midnight. Transferring it to the West End (after acclaim last year at Chichester Festival, helmed by artistic director Jonathan Church) is only the latest. Goucher’s first risk was commissioning the play in the first place, and having it written by Mark Hayhurst, who had never written a play before. Hayhurst, who wrote the 2011 BBC dramatisation about Hans Litten that inspired Goucher, is, undoubtedly, a major find – I hope Goucher will persuade him to write many more pieces for the theatre. Taken at Midnight is beautifully written, with so many stupendously quotable quotes, I’ve had to round my favourites up in a separate blog. It’s also a fascinating story. While Hitler’s suicide prevented him from facing trial at Nuremberg, he was once held to account in court. Litten, a Jewish lawyer, called him as a witness in a 1931 case in which two workers were stabbed to death by Hitler’s Brownshirts. Unlike his impressive oratory at carefully orchestrated rallies, under Litten’s three-hour cross-examination, Hitler fell apart, his racist philosophies, violent tactics and myriad contradictions exposed. In a thrilling denouement, we hear snatches of Hitler’s testimony verbatim: how much epic tragedy could have been averted if more people had properly listened in 1931? Instead, two years later, after Hitler was named Chancellor, Litten was arrested, branded an “enemy of human society” and put into “protective custody”, from which he was never released. He committed suicide in Dachau in 1938. Martin Hutson is devastatingly good as the “furtively brave” Hans, whose thoughts alone remain free. But the stage play, as opposed to Hayhurst’s film, The Man Who Crossed Hitler, starts with Litten’s imprisonment and focuses on the indefatigable efforts of his mother Irmgard to try to get him released. As Irmgard, Penelope Wilton stoically combines Mother Courage with Mother Theresa. Her quiet dignity and wry observations slipping into impassioned pleading in the face of the Nazi powers-that-be: “Take me, let my son go!” . As one of those Nazis, John Light gives a nuanced performance as an apparently good man amongst the many who “learn to be bad” as power shifts, while Mike Grady and a foul-mouthed Pip Donaghy are heart-rending as Litten’s more “demonstrably brave” fellow political prisoners. Taken at Midnight is booking at the West End’s Theatre Royal Haymarket until 14 March 2015.